Pick a helmet using lab test data. models coincided, but at least the ratings are based on actual lab testing. Should I wear a helmet at all? Fast info for Frequently Asked Questions. Is there an anti-concussion helmet? Not really, and here is why. Our report on this year's helmets. Lab tests showed no difference in impact protection. Do shared bicycle rental users need helmets? Our advice on riding shared bikes. How to get all the protection you paid for. If our pages seem too wordy, try this. Trek says they provide more protection against concussion. Product does not provide the protection required by the CPSC standard. Concussion ratings will push manufacturers to go beyond meeting standards. "Don't have much to protect" joke taken seriously out of contaxt. The Course fails impact tests. Will there be a recall? New York Times gets it right! But some airbags do not inflate enough. Helmets do not increase jaw injuries! Shell cracking where strap is riveted. Imagine the consequences for seatbelt use if this were valid. Recommends: lower pass/fail, more coverage, angular impact test for rotation. We don't think a bike helmet is enough for an ebike. Needed for bike share programs, but must meet CPSC for US. First study on helmet use. British Study on passing clearance. 2013 Re-analysis confirms our belief that data was misinterpreted. Some believe requirement will reduce cycling in the UK. Video paints helmet promotion as evil. Would you believe our advice? Where can I report a helmet defect? CPSC has a place to post your problems. Free helmet offer is bogus! BHSI did not call you and offer helmets! Shared bicycle programs/cycle hire schemes. Rentals always pose helmet questions. NYU study does not expose hidden danger in foams. University PR department gets headline wrong. What we have added or modified recently. Our report on helmets for this year. Where is the anti-concussion helmet? You can look for it...but you won't find it. Can a cheap, disposable helmet be made of pulp? Difficulties finding helmets that fit. A photo tour of CPSC's new helmet test facility. Case illustrates good and bad features of the database. All CPSC helmet compliance actions since 1995. Meanings for the helmet terms we use. Few folding models are available. Helmet plastics are probably not a cause for concern. The Kranium's designer attempts to break new ground. Are Ribcaps OK for cycling? They do not provide the protection you need. Sources of helmets for promotion campaigns. Should I buy a used helmet at a yard sale? Do you want facial protection? Our advice for riders with very large heads. Why can't I find a helmet small enough? Our advice for riders with unusually-shaped heads. Baseball caps, pony tails, beads, braids, "helmet hair"
Does a head cover affect helmet fit? Can ring fit systems fit your head? You can have too many vents in your helmet! Industry news on a few of the manufacturers. System simplifies the fitting process. How to fit a helmet for best protection. Size chart and how to measure your head for a helmet. Warm headgear for winter commuting and riding. Headlights and taillights mounted on helmets can be useful. Giving a helmet as a present. May not be a simple task. Should you add reflective tape to your helmet? Should you add stickers to your helmet? Can you paint a helmet? Ski, soccer, skating, equestrian and more. Can't I just use the same helmet for everything? Why a bicycle helmet is not ok for motor vehicles. Stories where the helmet worked. Helmet, no helmet or non-bicycle. These are downers. Ask your doctor before riding after a crash. Response to "truck ran over cyclist's head"
A helmet can help squirt the head out, but will crush if squarely run over. Helmet damage sensors and indicators. Most are not really concussion indicators. Are helmets with animals or spikes OK for kids? Cute, but we don't recommend them. Consumer Reports has a few ratings of Kid's helmets. Most are rated Good for impact protection. Helmets, trailers, childseats and shaken babies. Helmets for toddlers with very small heads. Helmets for toddlers with very large heads. What size is my child's head? Ten ideas for encouraging your kids to use helmets. Why kids don't like to wear helmets. Reasons the kids give when asked. Advice after deaths of two helmeted children. Kids in Dublin Ohio mount bike safety campaign. Lots of energy, new ideas as kids conduct their own program. "My teen won't wear a helmet!" Is a college brain worth protecting? Does an older brain need different protection? What to wear if you have a previous injury. Avoiding tan lines and other tips. Thinner helmets for small adult heads? Chrono helmets with extreme aero shapes. Cycle hire schemes pose particular helmet problems. How can a Sikh wear a bicycle helmet? Our quick summary of bike helmet standards. The long version: ASTM, ANSI, Snell, CPSC, CEN and others. The short standards comparison chart. Our idea of the perfect bicycle helmet standard. What is needed for further standards improvement. How much a helmet can take and keep on protecting. How helmets are tested in the lab. Labs who test helmets or supply test equipment. BHSI has tested hair products, sunscreens, repellants. The points to check, and a checklist. Our advice on when to replace your helmet. How to fix your helmet when it comes unglued. Can you find a replacement buckle? Maybe! Illustrations and photos to help you rethread. What to do with your faithful old helmet. Info on EPS, EPP, EPU foams and more types of liners. It can make better helmets, but not necessarily. Most are one basic design, but there are others. Info on ventilation and cooler riding. Our short list of independent helmet designers. They don't agree, so take your pick! NYC found 97% of dead cyclists had no helmet. Links to scientific journal articles and studies on helmets. Materials we have scanned in or downloaded. Helmet design for students and researchers. Info for a thesis or a science project. Info for a helmet design project. Points to cover when you do a workshop. Some significant patents and how to find others. We are interested in new helmet technology. Our guesses on manufacturing and sales costs. States, counties, cities, positions, opponents. Journal articles and studies on helmet law effectiveness. Helmet laws normally do not reduce cycling here. Issues from the "helmet wars"
Our slant on the endless helmet law arguments. Just a start on the regulations that apply for importing bike helmets. Washington Post article based on faulty study. Reporters can't find a real helmet issue, so . . .
What we do when we see one of those. "Head Injuries Piling Up?" Times' reputation sinking? Another university PR department gets headline wrong. Helmet news, not too frequent, you can subscribe. Welcome! We are a helmet advocacy program founded in 1989. We are a small, active, non-profit consumer-funded program providing bicycle helmet information. We are a 501(c)3 non-profit, so your contributions to us are tax-deductible. We try to explain the technology of helmets to consumers, and promote better helmets by working on improved standards. In a typical year our secure server serves 2 million pages to more than 700,000 distinct users. Our volunteers serve on the ASTM helmet standards committee and are active in commenting on actions of the Consumer Product Safety Commission. We are members of the National Bicycle Safety Network. We provide a Toolkit of materials for helmet programs and a periodic email helmet newsletter, both free. We are all volunteers, funded entirely by consumer donations. We maintain our independence by never accepting funds from the industry. As much as we believe in helmets we still consider them a secondary safety measure and urge that primary measures such as safer roads and education programs for riders and drivers not be neglected. Our FAQ: can you trust this site? Where we came from, what we do and how. Some nice words from the Consumer Reports blog. 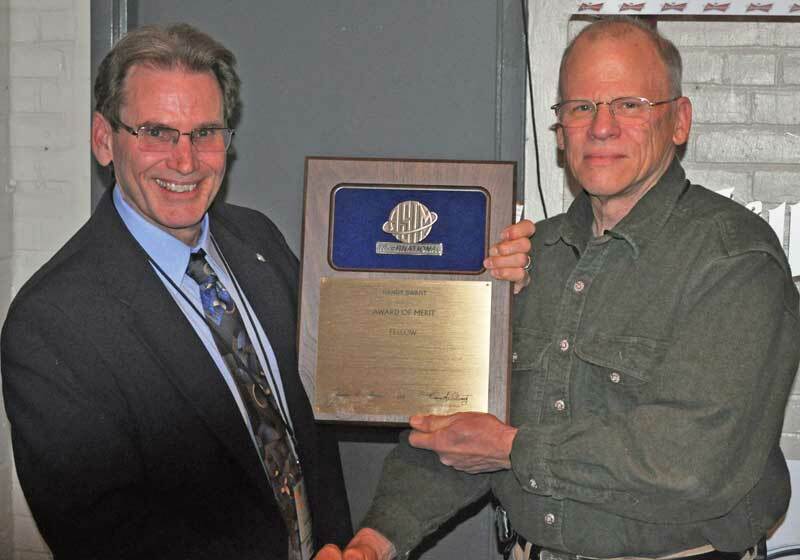 BHSI's founder named Safety Crusader. Recognition for BHSI's work on helmet standards. Highest ASTM award for standards committee work. Photo, Swart on right..
What we hope to accomplish this year. How to support our work! We are funded 100% by consumer donations. Graphics, crossword or teaching skills? Our philosophy, design, page hits and more. What we hope to add to our site some day. Citing us in footnotes for scholarly papers. Newsletter, pamphlets, list of laws, more. The Helmet Update, our periodic free newsletter. Quotes and a few rules on quoting our site. You can quote us but not borrow our pages. We post only a few focused links. Web, email, telephone, postal mail. Teachers, educators, scout leaders, workshops, rodeos. Resources, statistics, pamphlets, videos, lesson plans. Bike shop owners - We encourage you to use our pamphlets. We provide free duplicating masters. Finds anything on our site. A Map of our site. A page by page map in outline form. Links to other helmet-related pages. Links to people who have survived a head injury. We keep our links closely focused on helmets. Here is a page of tips on problems. We care about making our content accessible! Virus or spam message apparently from BHSI? Here is how a spoofer sent you that message. Virus-bearing messages do not originate here! We never send anything to anyone from "info@helmets". We like to hear about what you wanted to find here. We are consumer-funded and do not accept donations from the industry, including bicycle shops. © All pages on this site are copyrighted by the Bicycle Helmet Safety Institute, 1995-2019. Reproduction for non-profit use is encouraged, but on the Web please link to our pages rather than reproducing them--we update frequently and a copy will be quickly outdated. Webmasters please see this page. At least one page on this site was revised on April 18, 2019.